Rockhampton  lies on the tropic of Capricorn near the coast of Queensland, south of Mackay and north of Bundaberg. Rockhampton is one of Queensland's oldest cities, established in 1855. Rockhampton was named by Queensland's first Land Commissioner, Mr W. Wiseman, who was supposedly inspired by the rocks in the river which flow through the town. During the late 1800s, several nearby gold discoveries ensured continued economic growth of the region, and of Rockhampton itself. 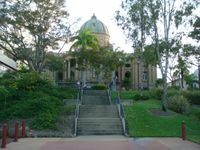 Subsequently, as mining, grazing, farming and meat processing industries developed in Central Queensland, Rockhampton thrived as a regional service centre. Rockhampton was finally recognised as a city in 1902, and has continued to grow slowly but steadily ever since. Rockhampton’s current population is around 59,000. 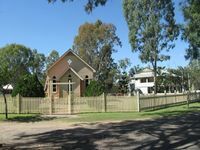 The Rockhampton area is surprisingly busy, with considerable traffic on the roads, and a substantial suburban area. It has a feel much more of a developed city than of an outback town. Rockhampton is almost universally called Rocky. Just about every business has some variation of Rocky in their name or their promotion. Rockhampton Airport (ROK) is just to the west of the city. Signposted road access is from the Bruce Highway heading south from the city centre. Qantaslink  has seven direct flights a day to Brisbane during the week, slightly less on the weekends. Virgin Australia  flies direct to Sydney, to Brisbane and to Townsville. Qantaslink also operates a twice daily all stops flight north and south, to Gladstone then to Brisbane heading south, and to Mackay, Townsville and Cairns heading north. The discount airlines flying the route mean that cheap fares from the eastern capitals are commonly on offer. Rockhampton airport has a central cafe, in a fully air conditioned terminal. It has an ANZ ATM available, and car hire facilities. There is a small Qantas regional lounge situated next to the Qantas check-in area. There is also an outside observation area. Rockhampton is accessible by sealed road, most notably the Bruce Highway which travels north from Brisbane, through Rockhampton and on to Cairns. It is 7-8 hours driving time along the highway from Brisbane. Road access from Sydney, Melbourne and other areas further south and inland is shorter via an inland route. Rockhampton is the terminus of the Liechhardt Highway. Driving time from Sydney is around 17 hours (non-stop). Tilt train services run to Rockhampton from Brisbane once daily, six days a week. The Spirit of the Outback ends its journey up the coast from Brisbane here, and turns inland towards Emerald and Longreach. The Sunlander continues from Brisbane up the coast to Cairns. Greyhound  have daily services from both Brisbane and Cairns. Roads are typically uncrowded, making driving in the area enjoyable, though drivers are advised to be cautious of the many large trucks on the Bruce highway. When travelling on back roads, watch out for straying livestock. There is actually a bit of peak hour in Rockhampton, especially on a Friday afternoon travelling over the bridges towards Yeppoon. Expect up to around 10 minutes of delay due to traffic. Taxis are useful for those wishing to travel to places of interest within the city, or to and from the airport. Travel time from the airport to the city centre is only 15 minutes. Rocky Cabs can be reached on the national taxi number, 131 008. The taxis also service Yeppoon although a fare there is expensive, and a bus or hire car may be a better option. Rockhampton is fairly flat, and most roads are uncrowded, which is good for those wishing to cycle around the city. Those wanting to venture further a field should be warned that the combination of rural drivers, and large trucks and cars with roo-bars, is not particularly bicycle-friendly. Be cautious. Rockhampton’s flat topography and compact size mean many attractions can be visited on foot, especially those in and around the city centre. Many of the attractions in Rockhampton are operated by the local council, which has a focus on tourism promotion. Dreamtime Cultural Centre, Bruce Highway, Phone: +61 7 4936 1655, . M-F 10AM-3:30PM. The Dreamtime Cultural Centre showcases Aboriginal culture, heritage and artwork. Local Aboriginal guides give regular tours through the centre, and describe regional tribal history, myths of the Dreamtime and the process involved in producing Aboriginal artworks. There are also displays of didgeridoo playing, bush tucker and boomerang throwing. A convention centre and accommodation are located on the site. 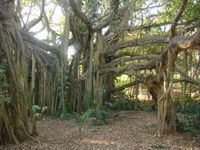 It is located 6 kilometres to the north of Rockhampton city centre. Rockhampton has 4 nightclubs located at the Quay Street end of William Street, and many bars scattered throughout the city. The Criterion Hotel situated at 150 Quay Street has a lively atmosphere and the bar and club is open till 3am Friday and Saturday. The "Cri" as it's locally known is a great place for food and a few drinks in the afternoon as well. Locally known to have a ghost as well. There are many motels in Rockhampton, mostly on the roads into and out of town. Many offer standby rates. Some newer motels are built in Rockhampton city centre and along the Fitzroy River. There is also a choice of accommodation in nearby Yeppoon, approximately 40 minutes drive from the centre of Rockhampton. Emu Park is about the same distance from Rockhampton and has a quiet, beach village feel. Rockhampton is about as far south as the habitat of the salt water crocodile extends. These animals are dangerous to humans. If you are travelling north along the east coast of Australia, Rockhampton is where you have to start being aware of crocodiles Crocodiles are seen in the Fitzroy River. This page was last edited on 9 February 2018, at 02:26.